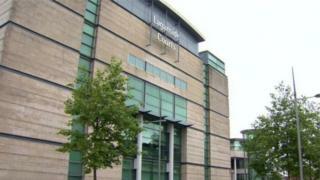 A former Celtic Football Club youth coach has been sentenced to more than three years in prison for sexually abusing a boy in Belfast. Jim McCafferty, 72, was found guilty of a series of sexual offences against the same teenage boy over a three-year period between 2012 and 2015. He was sentenced to three years and nine months in prison. McCafferty's links with Celtic were more than 20 years ago. He also worked at Hibernian FC. The jail sentence was welcomed by the Police Service of Northern Ireland (PSNI) and the victim's mother, who said what had happened to her son would "have an impact on him for the rest of his life". McCafferty was arrested in 2016 and later charged with eight sexual offences. He moved to Northern Ireland after spending most of his working life in Scotland. McCafferty, who was living in south Belfast, initially pleaded not guilty but changed his mind on the morning of his trial in May 2018..
At a sentencing hearing at Belfast Crown Court on Monday, Judge Patricia Smyth said the impact on his victim had been "significant". McCafferty first confessed to abusing the boy, who was aged 14 to 16 at the time of the attacks, after being approached by Daily Mirror journalist Jilly Beattie and photographer Alan Lewis in December 2016. The court was told McCafferty had a number of serious health issues. He entered the dock with the aid of a walking frame.